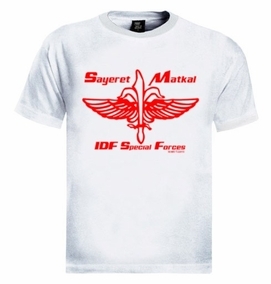 Sayeret Matkal (Hebrew: ????? ???"? - General Staff Reconnaissance unit) is the elite special forces unit of the Israeli Defence Force (IDF). Its main roles are counter-terrorism, deep reconnaissance and intelligence gathering. Considered by many as the premier fighting force in the world!! Our t-shirts are made of 100% cotton and are long lasting with bright colors. Our products are all designed and printed in Israel.